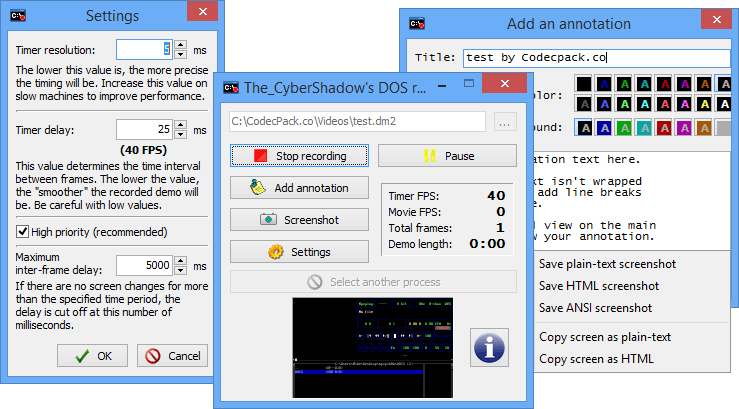 DOS recorder is an application which records "text videos" - the text output of console (text-only) applications (Windows, MS-DOS or Linux) into specially designed, cross-platform compressed "text demo" files and play them back. The Windows recorder requires an NT-based system (2000, XP, Vista) and administrator privileges. You can also associate the .dm2 files with the player if you want. The recorder only works for text applications with the window size set at 80 columns and 25 rows. DOS recorder support text-based games, presentations of old DOS applications or Win32 console applications.